Cleveland, OH (May 31, 2016) – In April, Howard Hanna Real Estate Services hosted its annual biggest real estate event of the year. For one weekend only, the company had thousands of open houses throughout our markets, offering a wide variety of prices, styles, and locations. In addition to being a great tool for home buyers, the open house event also celebrated the company’s newly unveiled tag line, Home Happens Here™. Southwestern PA winner: Emily Hauser, who attended an open house in Oakdale, PA.
Erie, PA winner: Shawn Wroblewski, who attended an open house in Millcreek, PA.
Central PA winner: Damon Garon, who attended an open house in Harrisburg, PA.
Northeast OH winner: Gene Lovely, who attended an open house in Saybrook, OH. Michigan winner: Brianna Haworth, who attended an open house in Monroe, MI. 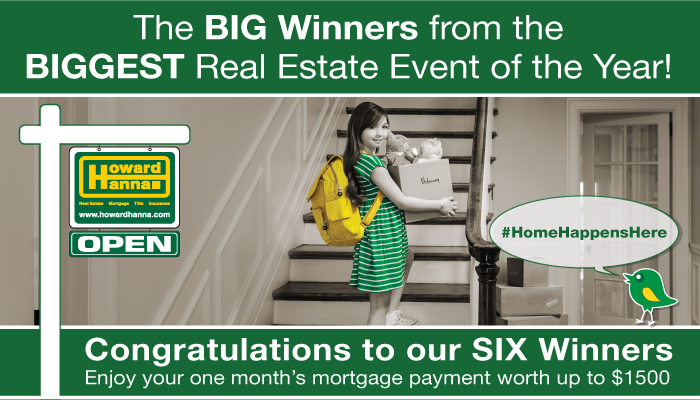 Virginia winner: Jennifer Eller, who attended an open house in Virginia Beach, VA.
Howard Hanna would like to extend congratulations to all of our winners and thank everyone who helped make Howard Hanna’s Home Happens Here big open house event such a huge success. Home sellers who missed the opportunity to participate in the biggest real estate event of the year can still list anytime with a Howard Hanna professional. To find one near you, go to www.howardhanna.com. Remember, if you list it, we will sell it! Howard Hanna Real Estate Services is the #1 real estate company serving Pennsylvania and Ohio and the 4th largest real estate company in the United States. The family-owned and operated real estate company specializes in residential and commercial brokerage service, mortgages, closing and title insurance, land development, appraisal services, insurance services, corporate relocation and property management. With 205 offices across PA, OH, VA, MI, NY, WV, NC & MD, Howard Hanna’s more than 7,100 sales associates, management and staff are guided by a spirit of integrity in all aspects of the real estate process.